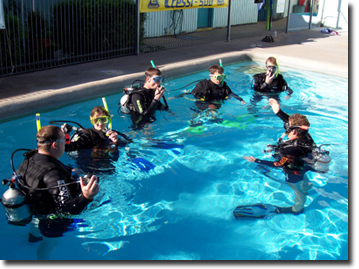 Cairns PADI Open Water is sanctioned by PADI and is conducted at the Cairns PADI diver training centre. Cairns Dive Centre staff are all dedicated, long serving experts with great communication skills developed through years of interaction with and training of diving students and hundreds of dives on Australia's Great Barrier Reef. Take the plunge and learn to dive on our 5 day PADI Open Water course.Complete 2 days of instruction at the PADI Cairns Dive Centre and then experience the adventure of learning to dive as well as staying out on the Great Barrier Reef for 3 days and 2 nights on a specialised dive liveaboard vessel where you will have the opportunity of using a portion of your Australia liveaboard dive trip as a qualified diver on completion of your Cairns PADI dive course. See our full Australia Liveaboard Dive Trips selection here. Your course includes 9 dives on some of the best dive sites the Outer Great Barrier Reef has to offer as well as plenty of time to snorkel, relax and really enjoy the underwater reef experience. The Pro Dive Cairns Dive Centre is unmatched for experience and value. Also available at the PADI Cairns Dive Centre are the PADI Referral Open Water Course, PADI Refresher Course, PADI Rescue Course and PADI Advanced course. For those customers who speak languages other than those mentioned above we also have PADI textbooks available in a range of other European and Asian languages. If you have a friend or partner who is either already a certified diver or perhaps a non-diver there is no problem with them joining you on the 3 day cruise. When you arrive at the training centre you will be fitted for your wetsuit, fins etc and optical mask if required. All stationery requirements needed for classroom activities. PADI Open Water Manual. (Available in English, German, French, Dutch, Danish, Swedish and Japanese). * You should book well in advance if you require particular dates or if you would prefer a double cabin. Most of the cabins are twin share (2 bunks) only two have queen size beds. You can look forward to seeing an array of marine life such as turtles, sharks and manta rays. Digital Underwater Camera's are available for hire at a cost of A$45 per dive. Please use the Booking and Enquiry Form below for your enquiry.